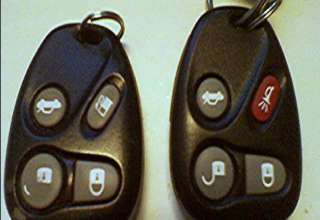 Whilst some of us dream of lazing in a Hot Tub after a stressful day at work the cost of these luxury items can sometimes be prohibitive. Well that’s not a problem anymore after a UK man came up with the idea of building one from two items that most parents have at home. 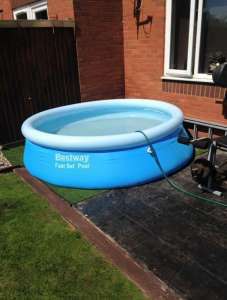 A paddling pool and a Trampoline. 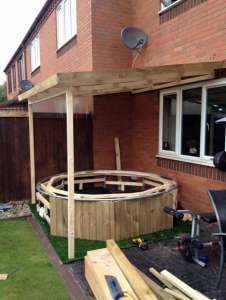 Steve Grogan fro Redditch in England used a Trampoline and some wood that he had lying around to build and amazing heated & filtered Luxury Hot Tub. 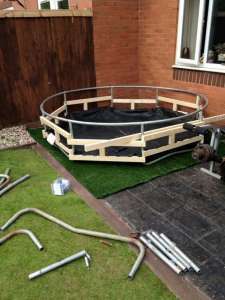 As the end of Summer approaches Steve wondered how he could use the paddling pool that was cluttering up his garden and happened to look across at the disused Trampoline frame in the corner of his garden. The Eureka, the idea was born and Steve got to work constructing his genius new idea. Using some old Polycarbonate sheets he had from a roofing job Steve was even able to produce a shelter for the Hot tub to keep him safe from the elements. 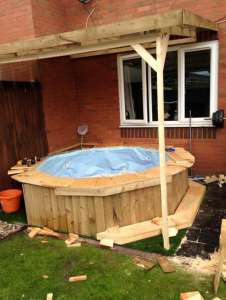 Using a rare week off from work and attended by his 5 year old daughter Steve was able to make the Hot Tub in just a few days much to the delight of his partner and their children. 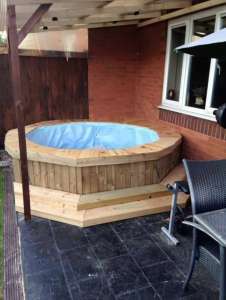 The Hot Tub which even has a heater and a filter fitted can be used all year round and keeps itself clean. The total cost was just a few hundred Dollars which is amazing considering shop brought versions can run in to the thousands. 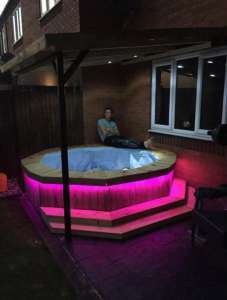 Steve’s amazing Hot Tub was so well received he’s now set up his own business producing them after so many people contacted him on seeing his story on Social Media. “I’m already out meeting potential customers and orders are coming in thick and fast” said Steve. 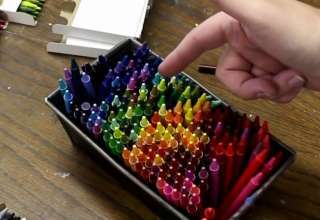 We think you’ll agree it’s a fantastic way of making use of what you have to produce something both useful and stunning. Well done Steve fro the team at Newsely!